A wolf in sheep's clothing: Someone or something that pretends to be good or friendly but is actually trying to cause damage, harm or take advantage of you. You're probably familiar with this idiom from ancient fables. Aesop's fable tells about a wolf that dresses in the skin of a sheep in order to get near a flock of sheep (some of which he planned to kill and eat). This idiom is most often used to talk about people but things can also be disguised to cause harm as well. Luckily I realized years ago that my mother-in-law was a wolf in sheep's clothing—she's nice but always highlights my faults and tells the family about every mistake I make. The proposed transportation bill was a wolf in sheep's clothing, hiding wasteful projects such as a $400 million bridge that would only benefit a few people. Watch out for your babysitter—by some of the comments she's made about you it's clear she's a wolf in sheep's clothing. My assistant was out of the office today so when I logged into his email account to get some information I also discovered that he was a wolf in sheep's clothing. My former best friend was a real wolf in sheep's clothing. He was always saying the worst things about my girlfriend and helped us to break up—but guess who he's dating now? Ninety percent of car salespeople are wolves in sheep's clothing. I refused to believe my colleague was a wolf in sheep's clothing until I saw her get full credit for a proposal I had written. Since then I keep all of my notes and ideas secret. I learned the meaning of a wolf in sheep's clothing after my lovely sister-in-law shared all of my problems with the rest of the family. Sandy: "You want proof that your best "friend" is a wolf in sheep's clothing? Well, she keeps giving you brownies to try make you fat; tells everyone you're a slob and she does all the cleaning in the apartment; and she just told that guy that you like you're not at home." Annabelle: "Wait, what?!" We filed a lawsuit against our former receptionist yesterday. We found out she was a wolf in sheep's clothing when she emailed some confidential documents to our competitor! 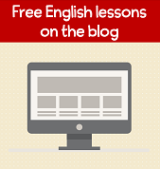 If you found this idiom useful, sign-up for my free newsletter to learn about new updates (e.g., idioms, lessons, blog posts) to my website. Have you ever discovered that any of your friends, colleagues or family members are actually wolves in sheep's clothing? Tell us about it! Writing your own sentences is the best way for you to remember new phrases and vocabulary. 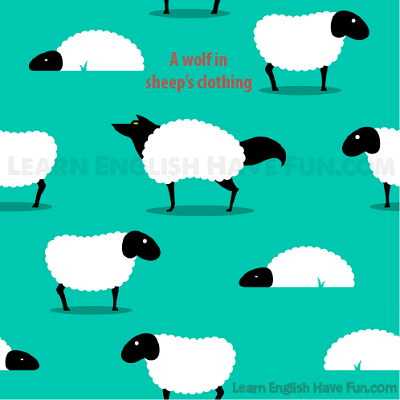 Return from "a wolf in sheep's clothing" idiom to the main idioms page.